Subaru President Tomomi Nakamura introduces the redesigned Forester crossover as a step toward rebuilding the brand's tarnished image in Japan. TOKYO — Subaru's American customers may be oblivious to the scandal roiling the company's management in Japan. But the automaker continued to address its fuel data tampering crisis in the home market last month, with its new president providing another public apology and introducing a new model he said will help put the embarrassment behind Subaru: an electrified Forester crossover. Subaru President Tomomi Nakamura is banking on the redesigned Forester to stoke U.S. sales and help rebuild the brand's tarnished image at home. The popular crossover's fifth generation hits Japan showrooms this month. For the hybrid-crazy domestic market, Subaru in September will also offer the Forester in an electrified variant called e-Boxer. The variant pairs a 2.0-liter, horizontally opposed four-cylinder direct-injection engine with a small electric motor to power the vehicle at low speeds and assist the engine in acceleration at higher speeds. 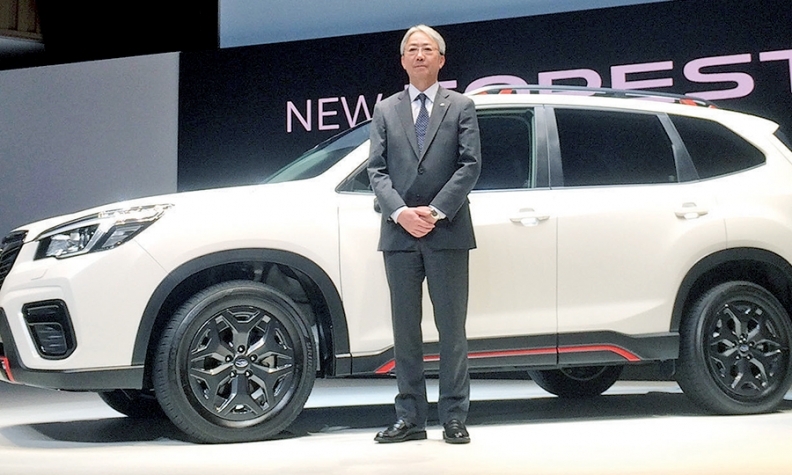 For now, the Forester hybrid will be available only in Japan, though the company also plans to sell it in China. The launch will be the first major test for Nakamura, who took over as president on June 22 after a string of data tampering incidents that rocked the Japanese automaker. Speaking at a media event in June, Nakamura apologized for the problems, which emerged late last year and led to 397,011 Subaru vehicles being recalled in Japan and reprimands from the country's transportation ministry. The scandal has been a nonissue in the U.S. but Nakamura pledged to win back the trust of Japanese customers who may be leery of the brand. "We will make the first step toward what we should be as a company, and that very first step starts with this new Forester," Nakamura said, adding, "In launching the new Forester, we hope to offer help to domestic dealers." Subaru's domestic sales plunged 23 percent to 9,007 vehicles in April from a year earlier, marking the sixth straight month of decline. Subaru attributes the drop largely to a comparison with high year-earlier results, boosted by the release of the Impreza in late 2016 and the Crosstrek in early 2017. But Nakamura conceded sales also were affected by the data-fudging scandal. Nakamura was optimistic about U.S. sales of the Forester, despite increasing competition in the hot compact crossover segment. U.S. sales of the nameplate dipped 0.6 percent to 177,563 in 2017. But Nakamura said its sales should reach 200,000 a year after the new generation arrives this fall. "In developing this model, we listened to our North American customers the most," he said. "The Forester is positioned as the mainstream SUV." In Japan, Subaru targets monthly sales of 2,500 for the updated Forester. The hybrid was developed in-house by Subaru and offers fuel economy of about 44 mpg, based on Japanese testing practices. That compares with 34 mpg for the base gasoline Forester version, with a 2.5-liter horizontally opposed direction-injection engine. The Japan-market fuel economy ratings cannot be converted directly into U.S. EPA ratings because Japan's testing regime is different.